Paul is wrong about the NIH budget increasing “for years and years,” even when using figures unadjusted for inflation. The budget was lower in raw dollars in 2014 and 2015 ($30.1 and $30.3 billion, respectively) than it was in 2010, when it reached a high of $31.2 billion. A spokesman from Paul’s office sent us the unadjusted dollar amounts to explain the senator’s claim. NIH, which is the primary funding source for basic science research in the United States, did see its budget increase dramatically from the mid-1990s, when it stood around $11 billion, through 2003, when it hit $27.2 billion. Since then, the budget has risen in small amounts some years in unadjusted dollars, and declined slightly in other years. When inflation is taken into account, no increase in funding is evident in the last decade. The $27.2 billion in 2003 is equivalent to almost $35 billion in 2014 dollars, when the NIH budget was just over $30 billion. 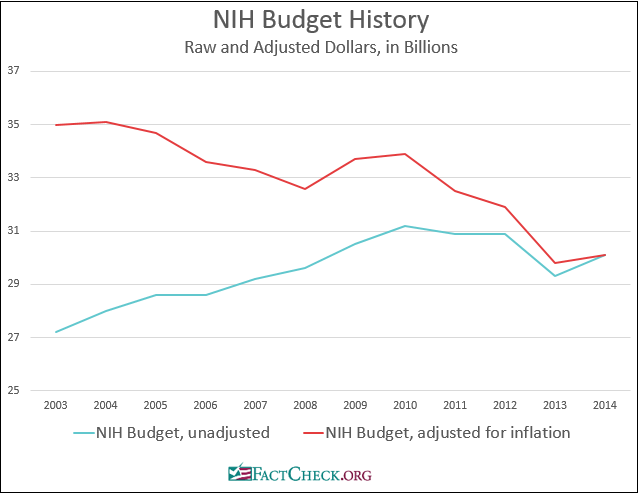 In other words, the NIH budget has actually decreased by almost $5 billion over the last decade in inflation-adjusted dollars. The earlier increases, from the mid-1990s through 2003, are still evident even after adjusting for inflation, rising from about $18 billion to $35 billion over eight years in 2014 dollars. Notably, the American Recovery and Reinvestment Act (known as the stimulus bill) did inject almost $9 billion of extra funding into NIH in 2009 and 2010; sequestration, however, required a cut of $1.55 billion from NIH’s 2013 budget. Paul’s spokesman did not mention these as part of the senator’s calculation. 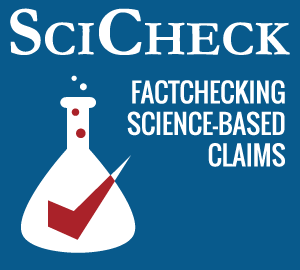 One other measure shows the decreasing emphasis on funding basic science research. From 2003 to 2014, the NIH budget in unadjusted dollars rose by 11 percent. The total federal government spending, meanwhile, rose by 62 percent. These same calculations using inflation-adjusted dollars show a decrease in NIH budgeting of 13.9 percent, and an increase in federal spending of 25.9 percent. Paul also said the budget specifically for infectious-disease research had increased; the National Institute of Allergy and Infectious Diseases (part of NIH) actually saw similar stagnation to the overall budget, with a slight decline when inflation is considered. The NIAID budget was $3.7 billion in 2003, equivalent to about $4.8 billion in 2014 dollars; the actual 2014 and 2015 NIAID budget was about $4.4 billion. An analysis by Vox showed that about $100 million was being spent on Ebola specifically in each of the last few years, which Paul’s spokesman confirmed is the source for his “one-40th” claim. The $100 million would be about that fraction of the total NIAID budget, and his spokesman pointed out that some emergency supplemental funding for Ebola research actually puts the number above that estimate; in December 2014 an additional $238 million was appropriated to NIH for Ebola research. Paul specifically called out one project involving fruit flies in his speech. In doing so, he grossly underestimated the value of scientific discoveries that can come from research using Drosophila melanogaster, the fruit fly. The fruit fly research Paul mentions is actually an ongoing series of projects in the lab of Scott Pletcher, now at the University of Michigan (previously at Baylor College of Medicine). According to a search we ran on an NIH database of grant awards, Pletcher hasn’t received one NIH grant worth $1 million. But he has had several recurring grants used for fruit fly research, ranging in dollar amounts from about $75,000 per year up to about $380,000 per year, which would add up to more than $1 million. Moreover, the characterization of the project as simply testing “whether male fruit flies like younger female fruit flies” is misleading. The study was in fact part of ongoing work looking into olfaction and other sensory perception, the aging process and how it relates to sexual and social activity. A paper that came out of the same line of inquiry appeared in the prestigious journal Science in 2013, showing that exposure to female pheromones without the opportunity to mate actually decreased male flies’ life spans. In short, sexual reward “specifically promoted healthy aging,” according to Pletcher. His lab’s work could yield insights both into how humans age and into aging-related diseases. Even the most important of discoveries, if described in certain ways, would sound just as ridiculous as Paul’s description of fruit fly sexual proclivities. For example: Researchers spent time and money counting up how many flies had white eyes and how many had red eyes. That might not sound like it has much practical import, but that work, by fly research pioneer Thomas Hunt Morgan, led to the understanding of chromosomes and heredity — basically, the way in which human traits are passed on from parents to children. Morgan won the Nobel Prize in physiology or medicine for this in 1933. This is not an isolated example. Three other Nobel Prizes have been awarded for fruit fly research, including for the discovery that X-rays can cause mutations in genes. Flies are useful for research because of their short life spans and the ease with which scientists can manipulate the insect’s genes. Bellen’s review published in 2010 highlights a few of the other discoveries made using Drosophila, from insights into how humans learn and remember things to how circadian rhythms (a sort of internal clock that all animals have) function in humans. He also pointed out that fly research is among the cheapest available. “You get 10 times more biology for a dollar invested in flies than you get in mice,” Bellen said, thanks to the ease with which their genes can be manipulated. Paul is entitled to his opinions on where government funds are best spent, but the study of flies has yielded important benefits to human health. Disclosure: The author’s father is a neuroscientist who has received NIH funding to do research involving Drosophila melanogaster.